Tesla does not currently offer Android Auto. We delve into what it is, what it might provide and issues that may slow or prevent implementation. Tesla has never stated if Android Auto will be available in the future and none of this article is based on any internal knowledge of Tesla’s plans. CarPlay, a similar system for Apple devices is covered in another article. Google’s Android Auto was launched in March 2014 and is available on one Hyundai car in 2015, and a few more in 2016. The design allows car-specific apps to appear on the car’s infotainment screen, with touch operations passed back to the phone. Android Auto works through a standard USB connector. Only devices with Android 5.0 or later are supported with Android Auto. Implementations are mostly done by a small number of third-party OEMs that sell the infotainment systems to major vehicle manufactures. We are not aware of any vehicle manufacture actually implementing Android Auto in-house. Select apps written specifically for Android Auto, such as Spotify, Overcast, etc. Licensing – Google offers a free license. Various patent licenses may also be required, but may be part of Google’s license. Control – Implementing Android Auto is ceding control and style to an outside vendor. Future features and design are outside Tesla’s control. This could benefit or harm Tesla’s direction. For example, if a gas MPG app were to be a “required” app that makes no sense on an EV, it just looks bad on the Tesla. On the other side, some new currently unknown app might be very beneficial to Tesla’s owners. One poster indicated vendors do have some control over what apps appear. Performance – Tesla uses a fairly high-powered quad-core computer for the infotainment system, so we don’t expect this is a limiting factor. Less known is the memory available to support Android Auto. We do know memory RAM and Flash memory is limited and adding Android Auto might require Tesla to remove or limit existing features. This could be solved on future cars with increased memory. A retrofit is also likely possible for older cars, but could be expensive. Software – It’s unclear how much work is required to implement Android Auto. Our guess is it’s a not trivial, but not huge either. Perhaps 2-4 man-years of software development. Some continuing engineering is also required to support future changes in Android Auto. Cost – There are no direct costs for use of the Android Auto software. Harm – We suppose it might be possible for a hacker to use an Android Auto app to hack into the Tesla and cause mischief. The implementation must isolate Android Auto so it can’t do any harm to other vehicle systems. Depending on Tesla’s current design, this might require a significant redesign of the base software, but we suspect it can handle safe isolation fairly easily. Competitor – With Google producing test autonomous vehicles, Google could be a future direct Tesla competitor. Tesla may not want give up any part of control of Tesla’s vehicles to Google. At the same time, Tesla already uses Google maps. Generally, Android Auto takes over the entire screen in landscape mode on small-screen cars. We presume that Tesla would provide an icon and pane for Android Auto. This is a mockup on how it may look. Perhaps Tesla can modify icon styles, text style and sizing to be consistent with the rest of the UI. Currently Android based devices can be controlled by Tesla’s vehicles over Bluetooth for phone calls, contacts, calendar, and music. 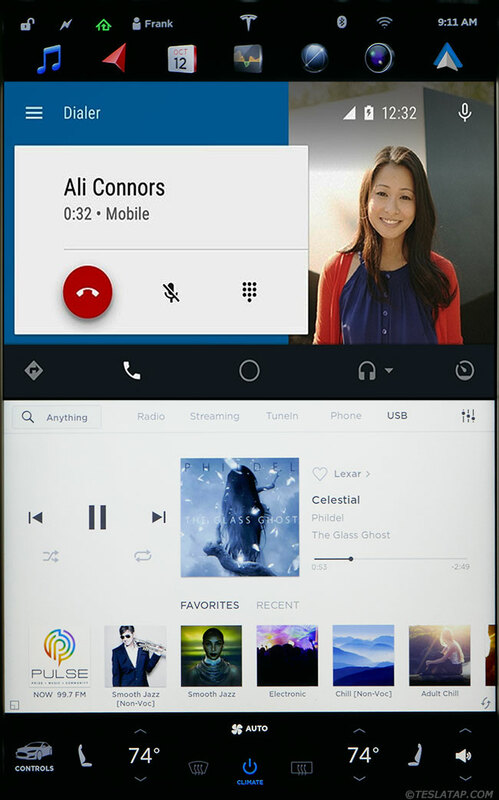 MirrorLink replicates the phone on the infotainment screen providing full access to the phone’s entire set of applications (not a limited Android Auto set). Tesla has stated some mirroring capability may be coming to the software. Until we see Tesla’s implementation, it is unclear if this will be better or worse than Android Auto. Some automakers include Android Auto for free when the premium display/navigation is purchased. Others charge an extra fee. For example, BMW charges $300 on the select 2017 vehicles that have a Android Auto option. Almost all major automakers are on-board with Android Auto, but few have any models with Android Auto as of 2016. Most plan to introduce Android Auto into new models in the next few years and it appears set to quickly overtake CarPlay, Apple’s alternative.